If you give most people a choice, they would probably prefer to swim in a lake where you can see your feet standing chest-deep than one where you can’t see your feet at knee-deep. Given this preference, we would assume that water clarity is a factor that determines recreating on lakes and purchasing lakeshore property. So how do you actually quantify this preference and does it really exist? These questions were answered in a study conducted by researchers at Bemidji State University in 2003. They set out to determine if water quality of Minnesota lakes affects lakeshore property prices. The area of study included Hubbard, Cass, Crow Wing and Aitkin counties. The researchers chose a variety of study lakes and examined residential lakeshore property sales that occurred over a five-year span. They used a hedonic model to attribute the portion of purchase price that is attributed to environmental amenities, such as water quality. The water quality measurement they used was secchi depth, which is a measurement of water clarity. The results showed that water clarity has a significant positive relationship with property value. In other words, the better the water clarity, the more the property was worth. This result was true for each of the lakes in the study. 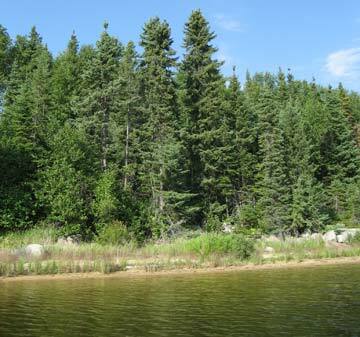 This study also revealed that property values change when a lake is improved or degraded. With a one-meter (3.3 ft) decline in water clarity, property prices declined by an average of $70 per frontage foot, which corresponds to $5,250 for a 75 foot frontage lot. With a one-meter increase in water clarity, property prices improved by an average of $46 per frontage foot, which corresponds to $3,420 for a 75 foot frontage lot. These results illustrate the importance of protecting lake water quality. Minnesota’s lakes are extremely important to the recreation and tourism industry, as well as our local economy in Detroit Lakes and individual property owners’ investments. If we all work together to protect water quality, we will see the benefit both aesthetically and economically. “If future generations are to remember us more with gratitude than sorrow, we must achieve more than just the miracles of technology. We must also leave them a glimpse of the world as it was created, not just as it looked when we got through with it.” – Lyndon B. Johnson.